Chemfix strives to offer a competitive advantage offering patented and innovative products. New innovations for the next generation of users. Chemfix chemical anchors are designed for safety and security. 50 years anchor life is built in to all European Approvals which are recognised around the world. Patented Mixer & Cartridge Technology. The new range of chemical anchoring products for 2019. Inlcuding three new products and new ETA Approvals. Please navigate to the downloads section to view now. Our powerful calculation software incorporates European Approved Chemfix anchors into the most critical and complex design situations. This flexible and portable tool is available for free download to our customers. Our drive is our commitment to our customers and seeing things from their perspective. Our goal is to innovate to provide you with practical solutions. Have you checked our video channel recently? Bring yourself up to speed and find out how our products work in real life and by independent test! Chemfix chemical anchors were recently used by a well known stone balancer, to display his stone balancing projects in a safe way. Latest from Chemfix at just one click. 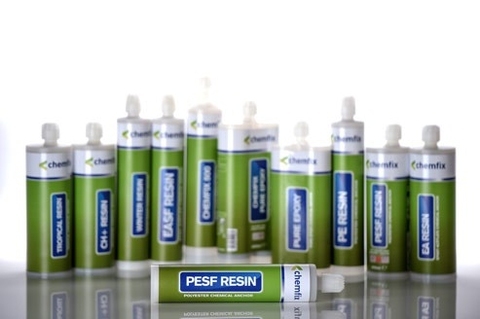 Get all the latest news and new product information direct from Chemfix by email.